On This Day - August 30th 1916 - The Rescue From Elephant Island. August the 30th 1916 would have dawned no different than any of the previous 127 days, for the 22 men stranded on Elephant Island, since their six comrades had departed the outcrop aboard the James Caird lifeboat, on a mission to raise rescue for them on April 24th 1916. As they had watched the tiny vessel disappear over the horizon into the monstrous Weddell Sea, Frank Wild optimistically opined that they would all be saved within four or five weeks. But four long months had passed, and despite a daily rostered watch to keep lookout for an approaching ship, the castaways hopes had almost entirely diminished. It was all too probable that the Caird had been enveloped in the fearsome Southern Ocean, and the six brave crew had perished long before they had reached land. And no-one would know of the men on Elephant Island, and no-one was coming to rescue them either. 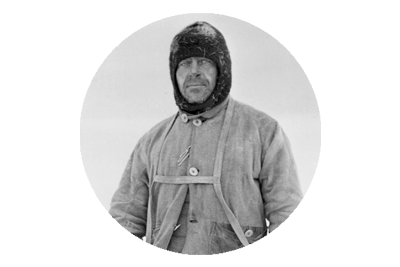 Wild was a man of calm countenance, even in the face of the gravest of circumstances that he faced, and none more so than those he was confronted with on the Endurance Expedition, which was his fourth of five ventures to Antarctica. 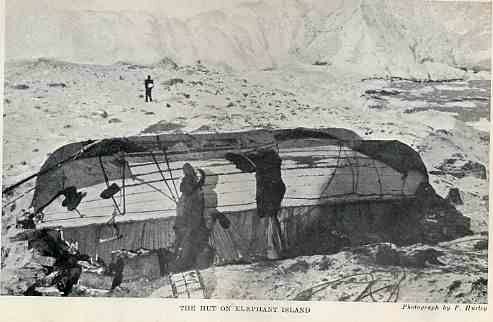 The group of men that he took charge of on Elephant Island, were in a pretty grim state. They had eked out an existence, living on the drifting ice floes, for months, after their ship The Endurance had been trapped in the ice of the Weddell Sea, in February 1915, and ultimately abandoned in October of that year as the pressure of the ice pulverized, and eventually sank the vessel. When the ice began to break up beneath their refuge, the 28 men were forced to abandon Patience Camp, and strike for land in the three lifeboats, which had been salvaged from the ship. They set sail, on April 9th, and whilst Elephant Island was not their intended destination, a combination of strong currents, the ever deteriorating condition of the men, and the probable chance of its attainability, eventually saw them set course there. That gruelling voyage took over seven days to complete and the conditions and sufferings aboard the boats were simply wretched. Miraculously all three vessels made safe landfall on the island on April 16th , and the most welcome of hot meals and shelter were hastily assembled. Shackleton had noticed that the high tide marks in evidence there, would prevent the establishment of a permanent camp, but elected not to inform his weary crew of the problem until they had acquired a much needed nights sleep. The following morning Shackleton dispatched Wild in the Stancomb Wills, and tasked him with finding a suitable spot for entrenching a durable settlement. Wild took with him – Tom Crean, Marston, Vincent and McCarthy as they were the strongest and fittest of the bedraggled party, and headed westwards in the tiny lifeboat. They returned having pinpointed an adequate site, seven miles west of their current position. Before long all 28 men were back aboard the boats and once again at the mercy of the Weddell Sea. Despite being a journey of only seven miles, and comparatively a mere jaunt, when measured against their previous gruelling voyage, it was still another debilitating battle of survival. Once they had successfully reached and established their camp at what is today known as Point Wild, the voyaging in the tiny boats was over, for most. But with no hope of rescue from their desolate isolation, one more journey was required. It would be by far the most dangerous, and highly improbable crossing ever undertaken in an open boat. Yet for the 28 men of the Endurance it represented their one and only slim hope of salvation. Shackleton decided that Wild would remain behind and take command of the group, with Tom Crean as his second in command, whilst he and five others would attempt the 800 mile crossing to South Georgia. 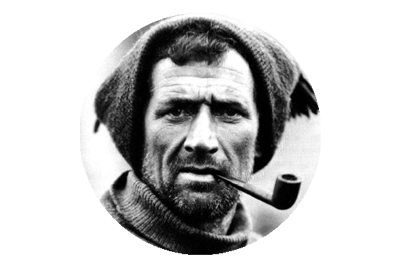 Crean however pleaded with Shackleton to be among the crew of the Caird, preferring to soldier the stormy savage sea, than remain behind in idle limbo. And so it was, that Wild’s duty was to hold together the spirits and morale of a group of men, abandoned on a narrow strip of freezing rock, surrounded by the furious, storm system that is the Southern Ocean. Men whose every fibre of physicality and sanity had been tested and shredded by the grueling demands of their ordeal. Men whose very fibres were now only scarcely seamed together by the material of their unlikely survival thus far. Wild set about making the situation as tolerable as possible. Lewis Rickinson had suffered a heart attack after landing on Elephant Island, Perce Blacborrow‘s feet were severely frostbitten, and all of the men had suffered greatly from the continuous exposure and near starvation of the journey there. Adequate shelter and respite from the elements was an immediate priority. The two remaining boats – the Dudley Docker and the Stancomb Wills, which had been somewhat cannibalised in the modifying of the Caird, were turned upside down and placed on stone walls, the materials for which, had been painfully scavenged and erected by the weary group. Every effort was made to secure the shelter. Tent canvas and timbers were used to good effect to stave off the cold. It was far from perfect but the ‘Snuggery’ as it was dubbed, served its fundamental purpose of providing quarterage and protection, though as time elapsed it wrought squalor. For the most part the men were confined to their shelter as the weather reigned appalling throughout. They were subject to an unrelenting series of storms, that lashed and howled around them, hurling the hungry seas to within yards of their refuge, rendering them fearful for their lives on more than one occasion. Within their dreggy confines they cooked, ate, slept and amputated the unfortunate (and probably ever regretful stowaway) Blacborrow’s dead frostbitten toes. In a feat of medical brilliance the surgeons Macklin and McIlroy, performed the surgery in the flickering candlelight of what must have seemed the darkest place on Earth. Each morning Wild would salute the day and his weary colleagues with, “Get your things ready, boys, the Boss may come to-day.” Tiresome it had become, as the days trickled by and no-one came. 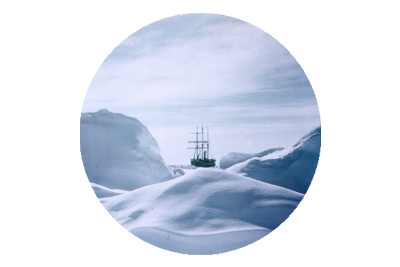 Yet Wild’s optimism , assignment of duties and unyielding faith in Shackleton’s return, had wormed its way into the psyche of the group, deep below the doubt and despondency, and delicately held their hope intact. Unbeknownst to them, the James Caird had reached South Georgia on May 10th. Shackleton, Crean and Worsley had then crossed the islands uncharted interior and had arrived at the whaling station at Stromness on May 20th. They had made an attempt to rescue them aboard the Southern Sky, and had been thwarted in their efforts by pack ice. Again they had twice endeavoured to reach them, firstly on the Instituto de Pesca No. 1, and then aboard Emma, and on each occasion fields of impenetrable ice would halt their passage. Instead of admitting defeat as the Yelcho towed the limping Emma back to Punta Arenas, Chile, Shackleton pleaded with the Chilean authorities to lend him the ship for one last attempt to reach his men, before the Antarctic winter consumed them. They agreed. “Get your things ready, boys, the Boss may come to-day,” – the ever conventional summon to a new dawn on Elephant Island. In this case it was day 128, post James Caird voyage. Hungry men were eating seaweed, and plans were afoot to abandon the huts, regard them as boats again, and sail to Deception Island, in search of food, a passing ship, or inevitable doom. October 5th was the date set – perhaps imminent enough to manifest or maintain hope, yet scheduled beyond the certain realisation of its folly. Just as every other day chores and duties were dispensed and completed, and lunch was being served, with less than four days food remaining. It was Marston who was staring out to sea, discerning all he saw, or perhaps not. The sea, the desperate warden of that desolate island, rolled and crashed ashore as it always did. Shrouded in persistent mist as it always was. Then something loomed in the fog… a blur… a shadow…a shape… a.. “SHIP O!” Marston wailed. He heard no response, and ran towards the shelter. No one ran anymore on Elephant Island, and the sound of rapid footfall, frantically crunching fresh fallen snow, alerted all within the upturned boats. “Wild there’s a ship…light a flare!” Marston gasped. The hut exploded with the adrenalin of escape, and there was almost a crush at the narrow doorway. The men in their delirium simply tore through the shelter’s canvas sides. They ran, stumbled, fell, tried to scream but croaked, tried to wave their heavy paining arms, for it was now or never. They could see the ship just rounding the island … “Signal it, raise the flag!” The flag was frozen solid so Marston hurriedly attached his jumper and hoisted it aloft, whist Wild drove a pickaxe through the last container of petrol, and ran to Penguin Hill where he set fire to any item of clothing he could lay hands upon. It really was now or never. Under the command of Luis Pardo, Shackleton, Crean and Worsley had sailed on the Yelcho, and to their utter jubilation the pack ice had fragmented before them and had finally afforded them their long sought passage. As they scouted along the coast Worsley spotted the camp, barely discernible beneath its shroud of snow, and anxiously they watched for signs of life. Almost immediately the saw the men emerge like ants, and a quick count of the manic dots on the rocky beach seemed to indicate that all were present. With no energy to sustain the immediate excitement, the men on Elephant Island wilted and watched the ship, praying for a signal that they had been sighted. For a brief horrible moment the ship turned away from them, and their distress was almost unbearable. Then elation with the realisation that a lifeboat was being lowered, and the unmistakable silhouette of the man climbing down the ladder. It was Shackleton. “The Boss” had returned for them. Quoted from – F.A. Worsley, Shackleton’s Boat Journey. *Shackleton, Worsley and Crean, shook hands – a quite modest acknowledgement of the successful conclusion of their heroic endeavours. There was no time to lose. The pack ice threatened to close around them, and transform the rescue into a new entrapment. Within an hour of first sighting the Yelcho, all of the men had been ferried aboard, plucked from their obscure desperation, and they sailed for Punta Arenas. 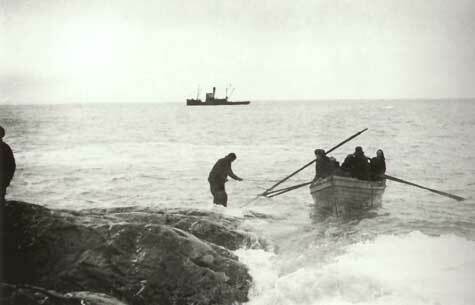 The Voyage of the James Caird, which was set in motion on April 24th 1916, when the tiny lifeboat was dragged from the relative safety of the grim desolate beach on Elephant Island, and cast into the most tumultuous and tortuous body of water on the planet, had finally reached conclusion. Six brave souls had climbed aboard and pitched themselves against almost certain oblivion, to somehow conspire to not just survive, but to endure, overcome, return, and pluck their comrades from the jaws of death, and from the final unbelievable chapter of the epic tale of The Imperial Trans-Antarctic Expedition – The Endurance. The Rescue from Elephant Island, August 30th 1916. 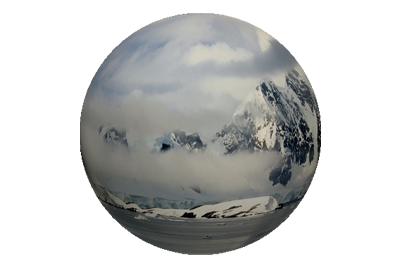 “Six years later when looking at Shackleton’s grave and the cairn which we, his comrades, erected to his memory on a wind-swept hill of South Georgia, I meditated on his great deeds. It seemed to me that among all his achievements and triumphs, great as they were, his one failure was the most glorious. By self-sacrifice and throwing his own life into the balance he saved every one of his men – not a life was lost – although at times it had looked unlikely that one could be saved.